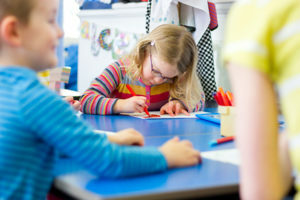 Disabled students enjoy rights under the federal Individuals with Disabilities Education Act (IDEA) to receive a free appropriate public education (FAPE). Recently, in Endrew F. v. Douglas County School District, the Supreme Court ruled that trivial or insignificant progress is insufficient to provide FAPE under the IDEA. Under the IDEA, school districts must provide an Individualized Education Program (IEP) reasonably calculated for the student to make progress in light of his or her circumstances. If Endrew F. stands for the proposition that there is a basic level of education that must be provided for students with disabilities, should that protection extend to all students? There are at least two hurdles to finding a U.S. Constitutional right to education: (1) the U.S. Constitution does not specifically recognize a right to education; and (2) educating children requires a variety of resources. Although there is no clearly stated right to education in the U.S. Constitution, various lawsuits have argued that the 14th Amendment equal protection and due process clauses guarantee such a right. They have been largely unsuccessful. (See San Antonio Independent School District v. Rodriguez, a 1973 Supreme Court case finding that the U.S. Constitution did not contain an educational guarantee under the 14th Amendment’s equal protection clause). Recently, however, a case was filed in Rhode Island, A.C. v. Raimondo, that included such 14th Amendment equitable arguments but also included arguments that an education is needed to participate as a citizen, including jury duty based on the 6th and 7th Amendments, as well as a rarely cited provision in the U.S. Constitution, Article 4, Section 4, that guarantees every state “a republican form of government.” The plaintiffs in Raimondo argue that a republican form of government such as ours requires an educated citizenry to operate and exercise their rights to vote or to free speech, or to serve on jury. If a federal right to education is recognized because an education is required for citizens to be capable of participating in civic activities, the next hurdle is what level of education would be required and the associated costs with providing it. If we extend a right to FAPE to all students, then schools districts must receive substantial increased funding. School districts do not just hire teachers. Some of the costs borne by school districts include: employing and training staff for specialized certifications; employing and training educational or child psychologists; employing and training specialized nurses, social workers, therapists and counselors; hiring behavioral consultants; employing and training paraprofessionals; building new facilities to maintain required teacher to student ratios; funding researched-based educational programs to help students learn; buying supplies, books, furniture, equipment; facilities and maintenance, utilities; and funding software programs and training to maintain required paperwork for compliance with federal and state regulations. In addition, if education is recognized as a U.S. Constitutional right, then school districts would be sued for alleged violations of a child’s right to an education. School districts would need to budget additional sums earmarked for attorney fees to defend itself against increased lawsuits. This would be in addition to the money school districts already budget for legal services and to pay parent attorneys under the fee-shifting provisions of the IDEA. Also, school districts need financial resources to deal with students’ mental and behavioral health. Due in part to the recent opioid epidemic and other societal factors, there has been a large increase in the number of children who need mental and behavioral health services. See Journal of Psychiatry and Psychiatric Disorders: The Opioid Epidemic: Impact on Children and Families, Vol I, Issue 2, 15 January 2018 (estimating 8 million children under the age of 18 live with at least one adult who has a substance use disorder in a home environment that is unstable and who are exposed to a variety of experiences that result in secrecy, loss, conflict, violence, and fear.) If parents do not have the means or health insurance to pay for services, the child comes to school often in distress or in crisis. If a child has a right to education but cannot be educated due to his or her mental and behavioral needs, then who is responsible for addressing that intervening cause? School districts are not mental health providers and are neither funded nor equipped to clinically treat students. Forcing schools to provide such services is at best a band-aid and leaves the child without proper comprehensive treatment. It also diverts funds away from education to try to help students’ mental and behavioral needs. This would result in less resources being spent on education–the exact opposite of what a right to education would hope to achieve. If recognizing a federal right to education is the first step to adequately funding school districts, then it’s a good first step. But, before we recognize a federal right to education, we need to determine what level of education is required (is it FAPE? ), and be willing to commit the necessary funds, including proper mental and behavioral health treatment. In Delaware County and throughout the greater Philadelphia area, Raffaele Puppio assists public schools and school districts in complying with the federal Individuals with Disabilities Education Act (IDEA), Pennsylvania’s Section 504 requirements, and all other federal, state, and local laws that govern the provision of special education services.